Lecturers can request examination copies for course consideration. The multidisciplinary field of quantum computing strives to exploit some of the uncanny aspects of quantum mechanics to expand our computational horizons. Quantum Computing for Computer Scientists takes readers on a tour of this fascinating area of cutting-edge research. Written in an accessible yet rigorous fashion, this book employs ideas and techniques familiar to every student of computer science. The reader is not expected to have any advanced mathematics or physics background. After presenting the necessary prerequisites, the material is organized to look at different aspects of quantum computing from the specific standpoint of computer science. There are chapters on computer architecture, algorithms, programming languages, theoretical computer science, cryptography, information theory, and hardware. The text has step-by-step examples, more than two hundred exercises with solutions, and programming drills that bring the ideas of quantum computing alive for today’s computer science students and researchers. 1. Complex numbers; 2. Complex vector spaces; 3. The leap from classical to quantum; 4. Basic quantum theory; 5. Architecture; 6. Algorithms; 7. Programming languages; 8. Theoretical computer science; 9. Cryptography; 10. Information theory; 11. Hardware. "The book has the potential to fill a void that needs to be filled: to bring the excitement of quantum computing to undergraduate computing majors, especially those with modest math backgrounds." "This is an exceptionally well written and accessible textbook on quantum computing. While there are a few outstanding graduate textbooks on the topic, this one has the unique feature of being accessible to typical CS undergraduates.... The authors have written this with great pedagogical skill. Readers will feel that they are having a conversation with the authors which makes it a great book for self-study." "This book gently eases computer scientists into the hybrid world of continuous qubits and discrete measurements from the ground up, covering all the essential mathematical prerequisites before diving into everything quantum: from algorithms and programming languages to protocols and hardware." "There are now a fairly large number of texts on quantum computing. This one differs from all those I have seen in that it is explicitly written for undergraduates with a very limited knowledge of physics or math, but some minimal training in classical computing. As such the book is extremely user friendly and has many exercises to explain the material, some in the form of programs the student can write to explore many sides of a given problem, almost like playing computer games. More complicated topics are illustrated by examples, rather than complicated formal proofs. There is a good list of references for further reading on individual topics, and suggested topics for projects. The book is clearly geared to the student of limited background who wants to learn about quantum computing without waiting to become an expert in classical computing. For this audience the book has no peers and is highly recommended." "The field of quantum computing strives to exploit some of the uncanny aspects of quantum mechanics for computing. 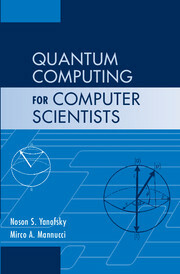 This book... stresses the computer science aspect of quantum computing." "... a very good addition to the list. This work has many attractive features. Definitely, a very fine book. "In a word, this is a well-structured text which deserves careful from consideration from instructors not only engaged with computer science teaching but also those in physics and electronic engineering." "this is a book that I can recommend to anyone with a basic knowledge of linear algebra. Not only will it make a very nice textbook for undergraduate computer scientists and mathematicians; it is also the kind of book one can give to a bright student to read on her own." "Happily, I found that I could fight my way through much more of the maths than I'd expected, largely because of the clarity of the style and the exemplary use of language. Presentation: Clear, elegant and comprehensive - with every effort made to make it comprehensible too. Would you recommend it? Yes."